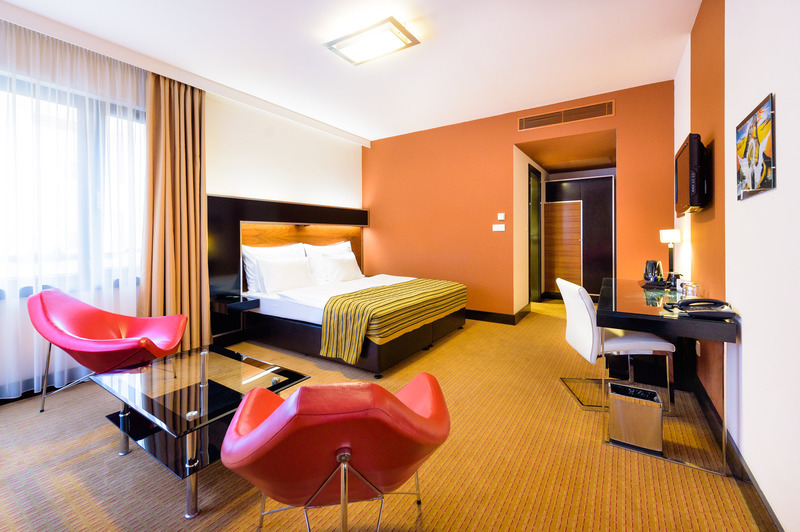 ﻿ Grand Majestic Plaza Hotel Prague. JIMAT di Agoda.com! Ada soalan mengenai Grand Majestic Plaza Hotel? Direka untuk kedua-dua tujuan perniagaan dan percutian, Grand Majestic Plaza Hotel terletak di lokasi strategik di Prague 01; salah satu kawasan yang paling popular di bandar tersebut. Terletak hanya 0km dari pusat bandar, para tetamu berada di lokasi sesuai untuk menikmati tarikan dan aktiviti di sekitar bandar. Bagi anda yang ingin pergi agak jauh, Arte Decor Galerie, 100CLASS concept store, Fruko Shop merupakan beberapa daya tarikan untuk pelawat. Di Grand Majestic Plaza Hotel, perkhidmatan yang cemerlang dan kemudahan yang unggul menjadikan penginapan anda tidak dapat dilupakan. Tetamu boleh menikmati kemudahan seperti khidmat bilik 24 jam, pengemasan harian, Wi-Fi percuma semua bilik, khidmat teksi, khidmat tiket. Tetamu boleh memilih dari 196 bilik, semuanya yang akan memberikan suasana ketenangan dan keharmonian. Di samping itu, pihak hotel menawarkan aktiviti rekreasi untuk memastikan anda mempunyai perkara untuk dilakukan sepanjang penginapan anda. 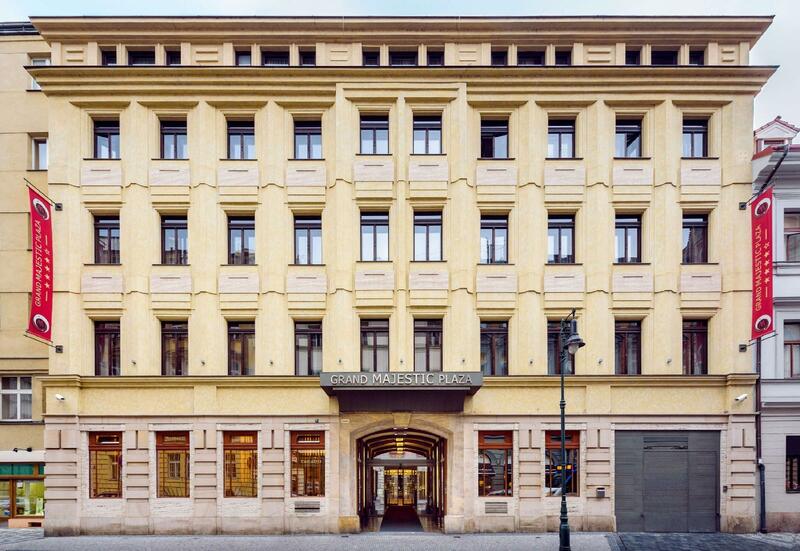 Apa juga tujuan lawatan, Grand Majestic Plaza Hotel merupakan pilihan yang terbaik bagi penginapan anda di Prague. As soon as your arrive , you know this is going to be a good place to stay. The hotel organised a minibus from the airport, very reasonable €40, reception check in is very friendly and the rooms are clean and well presented. Breakfast is great with a huge selection. 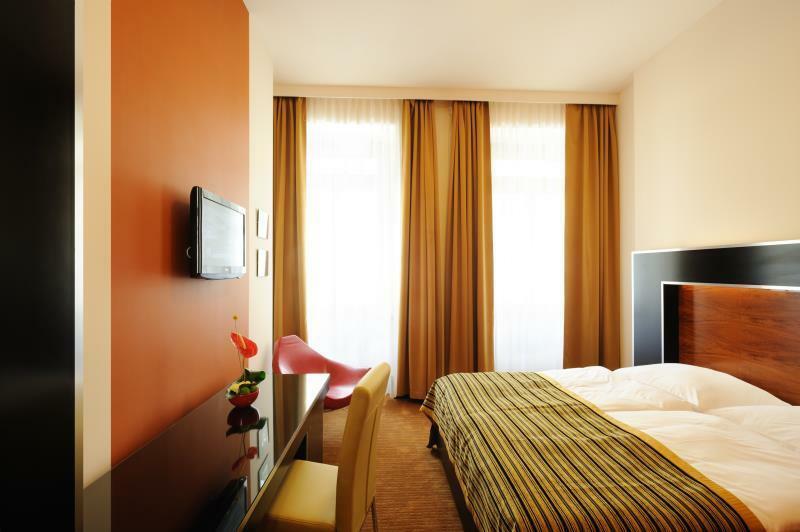 The location of the hotel is great, walking distance to everything. Would recommend to all. Location was central, breakfast was a good selection though it was literally the same every day... Not so bad if only the elevators worked properly. One was broken & the 2 that were working were very slow... after staying 4 nights the elevators were really an inconvenience.. especially since tour groups seem to like to book here because of the price, expect elevator traffic in the mornings. No outlets on the beside tables, only outlet available was at the desk. Our shower head was broken in 2 rooms. Other room the airconditioning wasn't working well. Despite us trying to get it fixed it still wasn't working & we just left the window open at nights.. Property needs some maintenance work done.. Will try another hotel on my next visit. I could not recommend. Will certainly stay at this hotel again when I go back to Prague. The room was clean and quiet. The bathroom was clean and spacious. We had a good night's sleep as the bed and pillow were soft to our comfort. The hotel staff were all very helpful and ready to assist. The breakfast was marvelous. So much variety of food not to mention the live piano music! Everything was just superb! Great hotel in not a bad location, lots of restaurants and bars close by and the big shopping centre near was handy if you wanted some retail therapy after a full day of sightseeing! 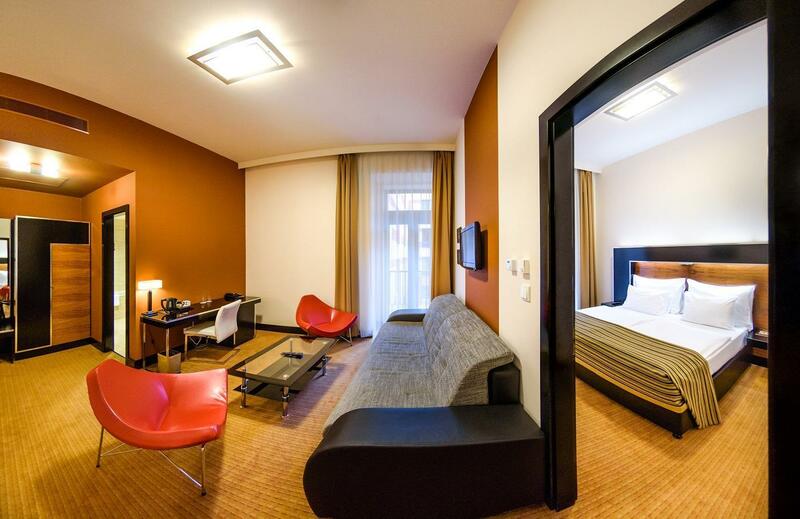 The rooms are spacious and very clean and fresh. The bathrooms are all newly renovated, however, they made the bath tubs too high. It is very difficult for smaller people like myself to get in, there is no where to hold onto as you climb in and out. I have no idea how elderly people cope! The breakfast was very nice and had lots of variety. The staff were excellent, after mistakingly booking a twin room for my husband and I online, the reception staff were more than happy to rearrange rooms the next day to move me to a double bed. My only complaint is that there was only one lift working when we stayed , with 5 floors and a full capacity , it made for long waiting times. Even the staff that cleaned the rooms were complaining. All and all a very enjoyable stay and would be happy to stay again. People can book this hotel with confidence. Top class for location, facilities, friendliness of staff and an amazing breakfast which sets the day up nicely. As an add on there is a terrific restaurant called La Boca 100m from the hotel. Brilliant ambiance and food here. Hotel was excellent. Room was very comfortable and air conditioning was superb. Breakfast too was excellent. Staff were polite . The ladies st the front desk were more helpful than the men and went out of their way to guide us. I stayed for 4D3N. is very easy to find,here are lots of restaurants nearby and the large shopping mall just around the corner , very good breakfast buffer many of choices,can walk to some of the point of interest like old town square,Charles Bridge and a lot more !!!! they gave us towel swan and some fake roses on the bed #honeymoon [decoration] while we checked in ..... the room is a bit warm ... but its ALL GOOD .. Very elegant but some questionable practical features: nowhere to hang hand towel and powerpoints are under the desk. No soap etc, just squeeze packs. But bed very comfortable. Reasonable breakfast. Very easy access to everything a visitor wants to see. Very good breakfast. Nice and clean room. Some times we needed to wait for the elevators few mintes. Great location in centre of town. Excellent breakfast. It's a beautiful hotel indeed. The stuffs are cooperative. Breakfast is very delicious. Location is also nice. The room is clean, all the equipments are brand new. Staffs are nice and helpful.